In the <?xml:namespace prefix = st1 ns = "urn:schemas-microsoft-com:office:smarttags" />Yangtze River source region in Kekexili, or Hoh Xil, there is a natural conservation station, the first one in this area. Hoh Xil is located in the northwest of the Qinghai-Tibet Plateau, covering 830,000 square kilometers. It is the world’s third largest and China’s largest non-populated zone. Remaining in a natural state, Hoh Xil is home to a variety of wild animals such as Tibetan antelopes, wild yaks and Tibetan kiangs, which are indigenous to the Qinghai-Tibet Plateau. However, driven by huge economic benefits, poaching has become increasingly rampant. Serving as a frontline base for anti-poaching activities, the station was named Sounan Dajie Nature Conservation Station in commemoration of the leader of a team to crack down on poaching activities who was shot dead by poachers in a fight on January 18, 1994. Yang Xin, a river explorer, sponsored the establishment of this station. He raised a sum of money from the sales of his book, Soul of the Yangtze River, and with these funds the station was set up at the foot of the Kunlun Mountain in September 1997. 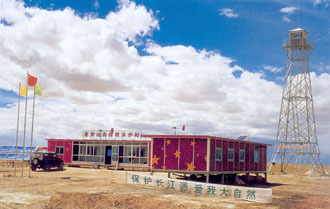 In August 1998, funded by the Shenzhen Yingtetai Investment Co., Ltd. and environmentalists, some necessary facilities such as solar heating equipment, a lookout tower, kitchen and lavatories were installed. In 2000, 1,400-watt solar and wind generators were installed in the station with funds raised from the sale of the picture album, Source of the Yangtze River. Using these funds, the station also bought computers, satellite phones and a jeep in that year. On January 1, 2001, the station began accepting volunteers. By the end of 2002, over 200 volunteers had worked in the station.